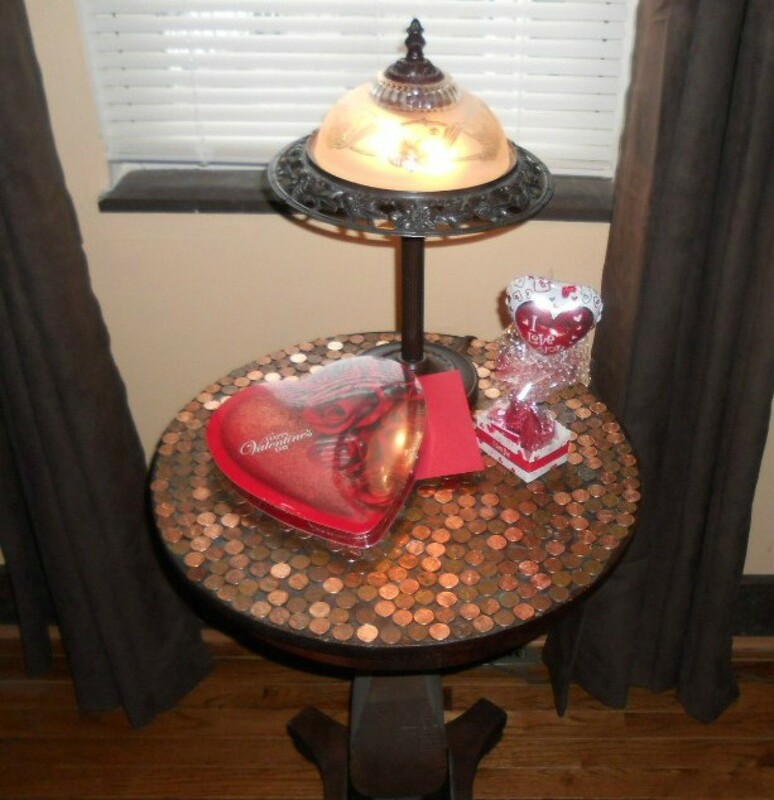 An attractive finish to a table can be these coins. 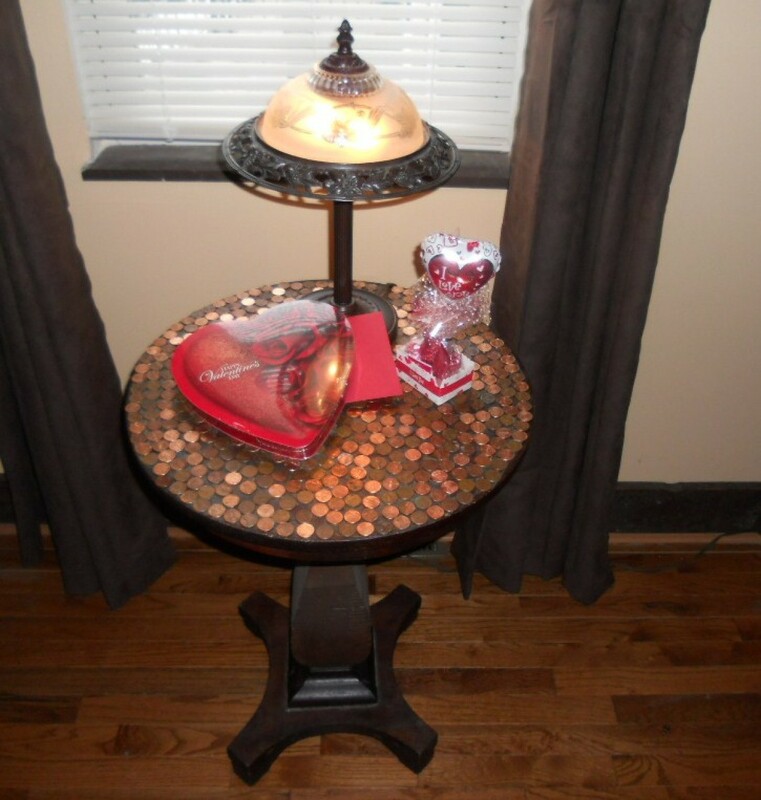 This guide is about covering a tabletop with pennies. I had an old wood table that I was embarrassed about as the top was cracked. Most old side tables, stands, end tables get most of the wear and tear on the flat surfaces. I cleaned the table, filled the crack with Elmer's Wood Glue and let it dry thoroughly. The next step was to gather up all the pennies I had and I also picked up a few rolls at the bank. I did not use any particular order, no all heads up or tails, just random. I painted the top of the table with a clear glue, I added the pennies one by one. It did not take long at all! (Be sure the penny does not stick over any edge.) After all the pennies were set, I put the table out of the way for a day so it would dry and not be bumped. Next step, I painted polyurethane over the entire top, again I let it dry for 24 hours. Everyone loves it. When the sun light shines, it is so amazing! It reflects the different colors of old and new copper. I merely dust it off with a microfiber cloth. It is a unique conversation piece. It didn't cost much money or time, but is fun and unique. The old wood table is back; better than before! That really is amazing. I love doing things like this on a smaller scale like in trays and on trivets, too. Very cool. Thanks! It is much prettier in person! Instead of buying glass tiles for the kitchen back splash project, I may use pennies! What Are You Doing to Pinch Pennies?